Engineering Motherhood: Quick Takes Updates! I've been out of the blogging grove lately both because I'm so busy and I feel I have so little to say! But today seemed like a good time to share a few things! 1. First, on the adoption front, we have an interview! We expressed our interest in being matched with a teenage girl and for the first time the answer wasn't "no"! It was, "come interview"! So next Thursday we'll be traveling down to central Indiana to meet with the girl's caseworker and maybe a few others. I have no idea what to expect since we've never made it to this stage before, but I am cautiously optimistic! 2. Last night we made asparagus risotto. I always forget just how yummy this recipe is. Click on the link, make the risotto. Even though you have to stir constantly for 20 minutes, it is so worth it! Yum! 4. Easter time was full of fun and chocolate. I applied my traditional method of allowing the kids to have as much as they like. I see it as a win-win. The kids are extremely happy, I don't have to police the moderation, and the candy disappears quickly, In fact, sometimes they get bored of eating it and play in it instead! Finn created some peanut butter cup towers and then squished them when he was finished! 5. Lucy also enjoys sweet things and making messes. I was doing some work in another room while Lucy was supposedly having quiet time. 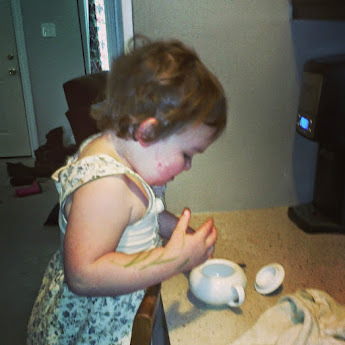 Instead, she was enjoying all of the sugar from the sugar bowl! 6. And not to be left out, Blaise also enjoys sweet things, although usually not in such messy fashion! 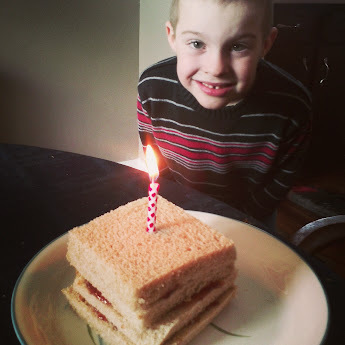 Here he is with his wishing cake, from the book "Zuzu's Wishing Cake". It's supposed to have a dandelion on top rather than a candle, but this was taken back before the dandelions took over our yard! 7. I'll close with a picture from our pi day celebrations, which, contrary to what the above pictures suggest, did not include any pie! 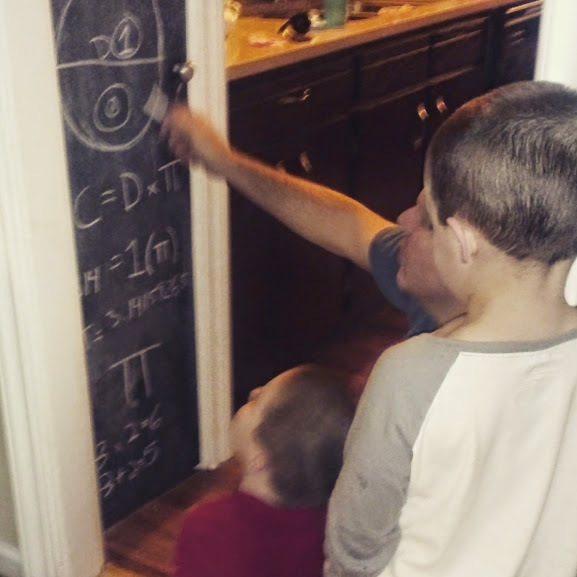 Instead, John gave a great lecture on pi using our new chalkboard painted kitchen cabinet! Yay! For the return of quick takes!